We see Oldham Council leader Jean Stretton is upset at the Oldham Deprivation story and the fact it used outdated 2011 ONS statistics. Of course the Council leader does not mention that Oldham Council’s 2014-15 financial accounts use the same statistics to avoid highlighting a 74% increase in immigration in a year, no such courtesy was offered to old people, highlighted as an expanding burden. Oldham Council and Oldham’s Labour politicians are very good at pointing the financial finger of rising costs at the aged who are the least likely to see these references made across digital publications and social media. Local politicians never make reference to immigration or tax credit costs or that Public Health England’s National Diabetes Audit for 2015 recorded 14.4% of hospital beds at the Royal Oldham Hospital occupied by diabetes patients. Just 1.4% of the diabetes patients audited at the Royal Oldham had type 1 (genetic/inherited) diabetes. Graph from the DWP showing the 74% increase in adult migrant NI registrations. 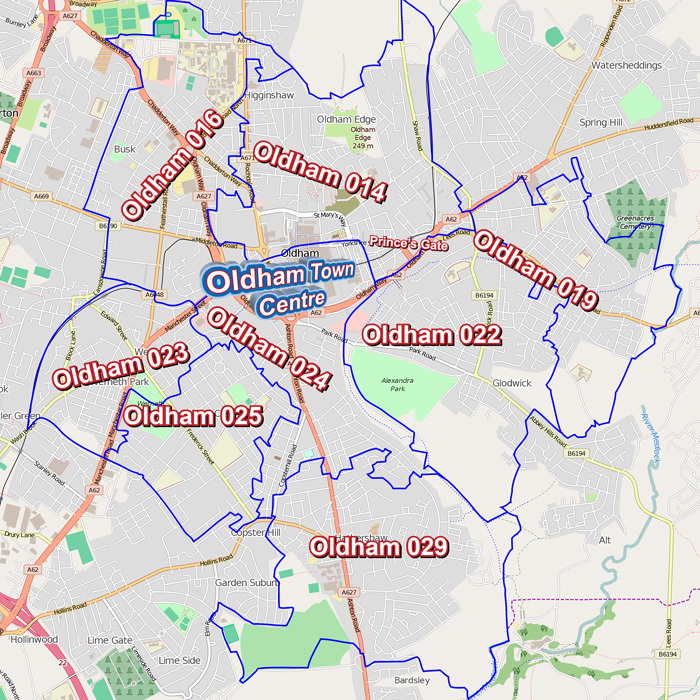 Oldham Town Centre MSOA’s, 75% of all national insurance numbers issued to foreign nationals in Oldham in the last decade have been issued to addresses within these eight deprived Middle layer Super Output Areas. Jean Stretton also says Get Oldham Working “created 3,700 new work-related opportunities” Not true! Oldham Council creates some of the opportunities with it’s huge regeneration spending but also facilitates many by advertising them but plays no part in their creation. We also find the figure given as dubious, when we talked to Get oldham Working on November 18th 2015 they stated they had facilitated 2,548 opportunities but just 1450 were sustainable jobs. Immigration, asylum & inter-council relocations are far outstripping job creation in Oldham but the subject is completely off the discussion agenda at Oldham Council. 3,700 new work-related opportunities is paltry when you consider that in 2013 Oldham had 10,709 fewer workplace jobs than in 2004 and the Town Centre has accomodated more than 9,630 adult migrants in the last decade. Jean Stretton also writes “We’re attracting major new retailers and investment, including Marks & Spencer” As anyone who frequents these pages knows M&S are getting a £9 million contribution from the developer, Oldham Council, towards the fit out cost of the store and get the first six months rent free, who wouldn’t find that attractive?